Sunrise at Campobello, Dory Schary's play depicting FDR's early battles with polio, made its Broadway debut on January 30, 1958. Later made into a successful movie, the play chronicles FDR's personal journey from his affliction with polio in 1921 until his "Happy Warrior" speech at Madison Square Garden in 1924. Although intended to be an inspirational tale about FDR's ability to overcome adversity, the play and its film version were more successful at creating an unflattering image of the president's mother as a heartless and domineering aristocrat. Surprisingly, this depiction of Sara Delano Roosevelt has had remarkable staying power, remaining the way she is perceived by most observers taking a cursory interest in the Roosevelt family. In addition, it has also shaped the way many people regard SDR's relationship with her daughter-in-law, Eleanor. Although their relationship was stressful at times, in no way was it nearly as simplistic as Sunrise at Campobello would have its audience believe. Unfortunately, it is difficult to shake a misconception once it has entered the public consciousness, and even more so when that misconception reinforces a widely held American stereotype that regards mothers-in-law as difficult and unsympathetic people. Caroli, Betty Boyd. 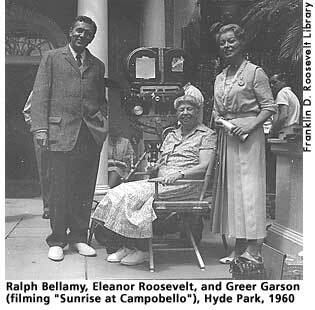 The Roosevelt Women. New York: Basic Books, 1998, 229-230.